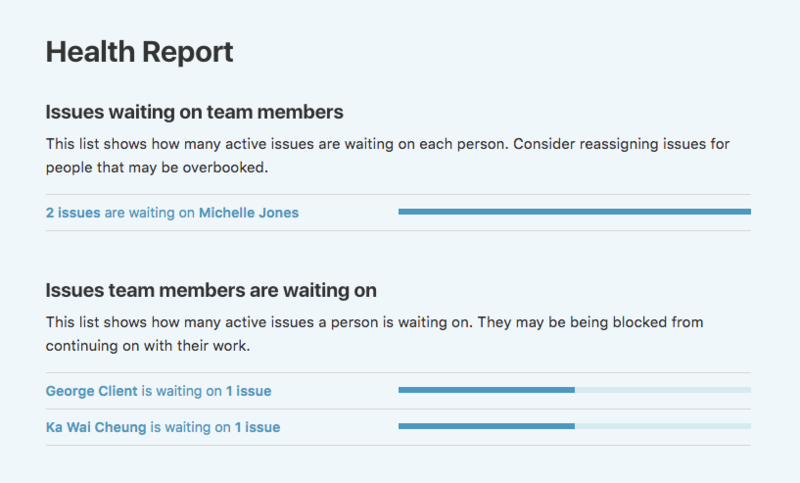 With the Health Report, you can get a quick glance of where the bottlenecks in a project live. Perhaps 75% of the open issues in the website redesign project are waiting for Jeremy’s input. Maybe Chris has no issues waiting on him for that big client project, but he’s waiting on responses from them on 6 other issues. The Health Report gives you that quick diagnosis of how things are going on a given project. It's a really useful tool for project managers. You can then click on any person listed in the Health Report to view a list of the issues waiting on them, or the issues they’re waiting on others for. This will give you further insight into where issues are being held up. The Health Report also shows “stale” issues. These are issues that haven’t been tended to for more than a week. They may need to be revisited, put on-hold, or closed altogether. If you're an account or project admin, you can get to the health report by first going to the project's dashboard, clicking on the Project Settings icon and choosing Health Report.